Wild Prairie slot is from UK developer Gamesys who make slots exclusively for the Virgin, Starspins, Monopoly and Jackpot Joy casinos of the Gamesys group. There is rush to make multiway slots after the success of games like Aristocrat’s Buffalo and WMS’ Raging Rhino and to be honest this is simply a replica of the former game mentioned, Buffalo. 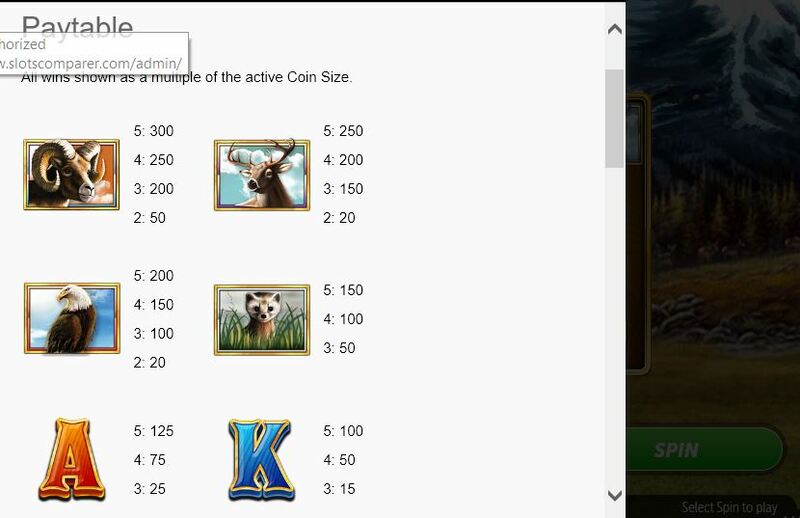 The animal icons can appear stacked in pairs and the card symbols up to 3 rows high and we pay 40 coins for a spin. The top pay on Wild Prairie slot is naturally the most powerful animal which awards 7.5x bet for a full way over all 5 reels and you’ll not get less than 2.5x bet for any of the card values present. 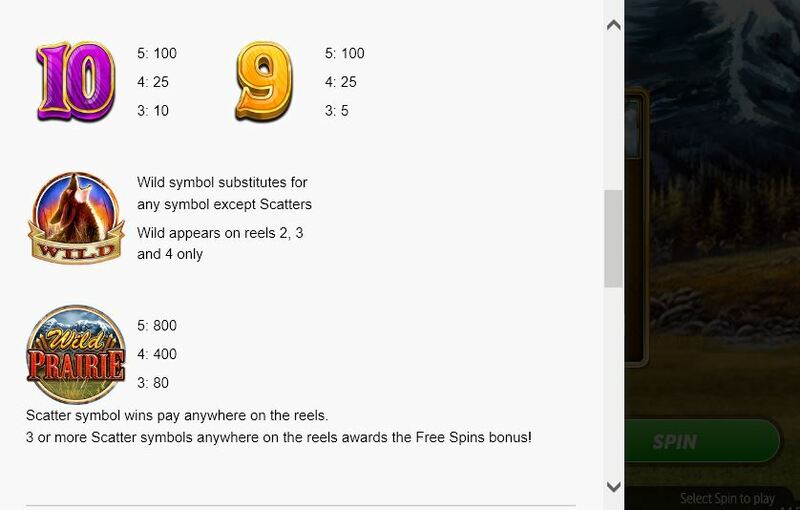 The Wilds can help and appear only on the centre reels and only singly to boot, but do have a special function in the bonus which is triggered by the other single icon, the logo scatter. So you can earn 7 to 20 free games by seeing 3 to 5 of those scatters anywhere in view and will earn 5 more games with only 2 appearing in the bonus itself, along with the standard base game triggers for 3 to 5. 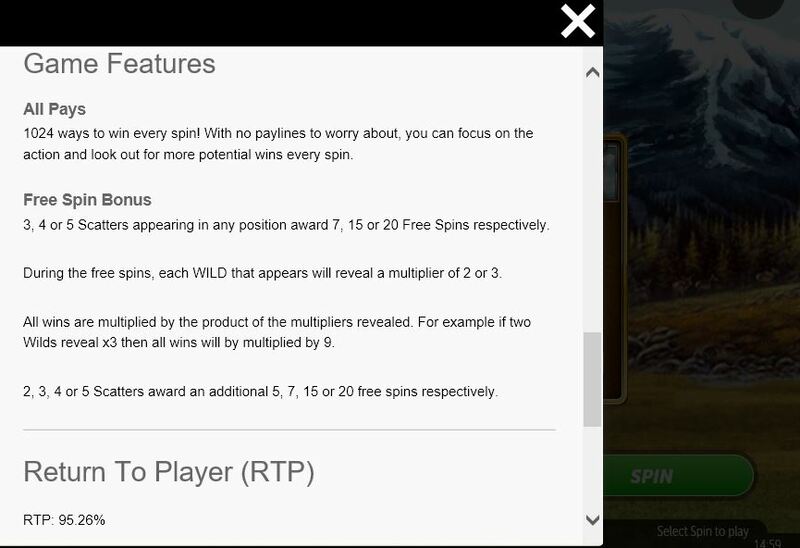 During the free spins any Wild appearing and involved in a winning combination will turn randomly to either a 2x or 3x multiplier, so if you land all 3 Wilds on the middle reels you will get at least 8x and up to 27x multiplication on all winning ways which in this scenario would be either 4 or 5-reel wins. 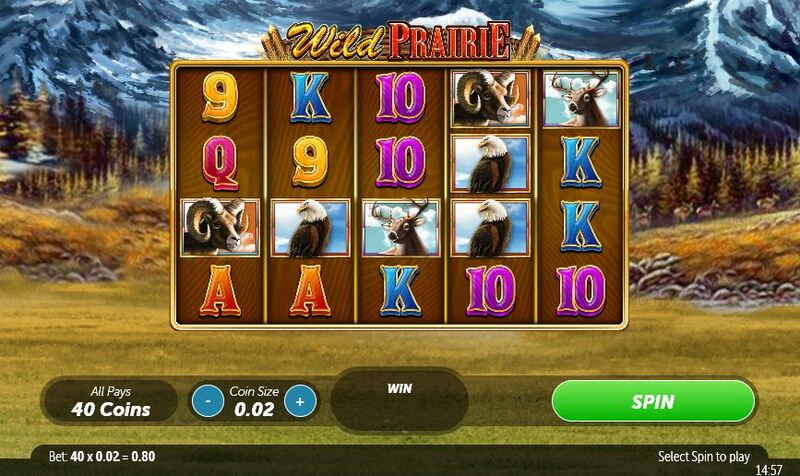 The RTP of Wild Prairie slot is rather mediocre at a 95.26% and the slot doesn’t have the gravitas of the more established versions with better graphics, but it won’t hurt your balance too much with its frequent base game hits and regular feature triggers.